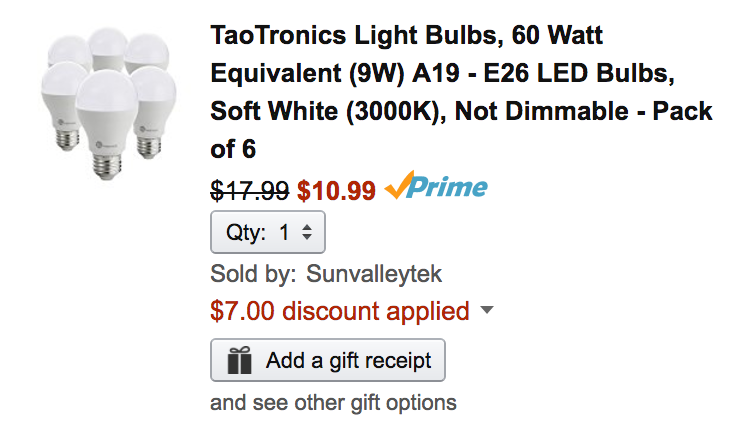 Sunvalleytek (99% positive feedback all-time from 262,000+ customers) via Amazon offers a six-pack of TaoTronics 60W A19 Soft White LED Light Bulbs for $10.99 Prime shipped when promo code HL63ISTM is applied during checkout. That’s good for $7 off the regular price, $1 less than our previous mention and the best offer currently available. Ditch those old light bulbs and make the jump to these best-selling LEDs. You’ll be able to cash in on solid energy savings over the 25,000 hour life of these bulbs. Rated 4.7/5 stars by over 1,100 Amazon customers. These 9W LED Bulb is as bright as traditional 60W bulb but only consumes 20% of energy, so you can easily save your power bill by 80%. Each bulb comes with a lifespan of 25,000 hours. If used 3 hours a day, that is a whopping 25 years before needing to replace the bulb, save you energy, time and money. The LED bulb offers stable glare-free soft light, creates a cozy ambiance. The right amount of illumination saves your eyes from stressing out, perfect for household lighting. It is mercury free, causing no harm to you, your home or the environment. You can use it to light up your living room, bedroom, study or office worry-free. Compatible with your existing regular fixtures, by a simple screwing, you are ready to go.